Trena came up to Baltimore Friday night to be my date for an Artscape party. 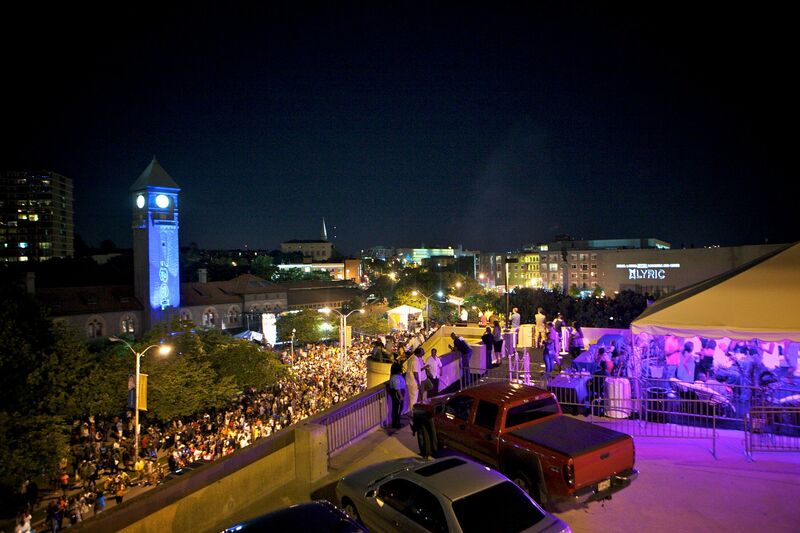 Artscape is the largest outdoor arts festival on the east coast and is hosted right here in Baltimore. 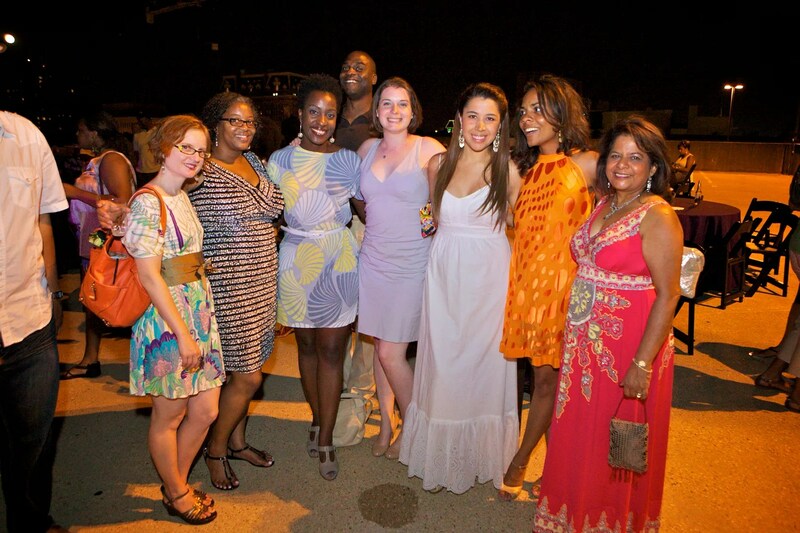 That night, I was invited to a rooftop party to celebrate the 30th anniversary of Artscape. There was a live Fantasia concert on the ground. 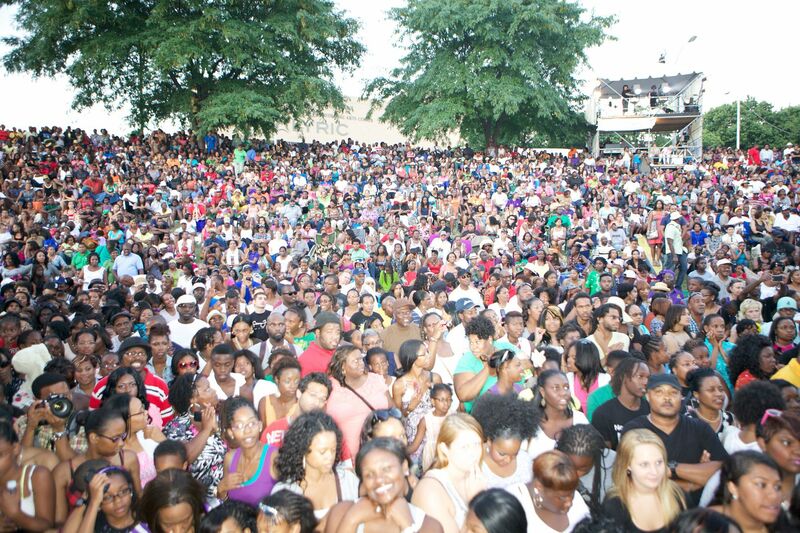 There were SO MANY PEOPLE. They were expecting 350,000 people over the weekend. Cocktails and food were on the roof and fireworks at a reasonable hour (I just can’t stay up late). Here’s a photo of us with some of my work friends. 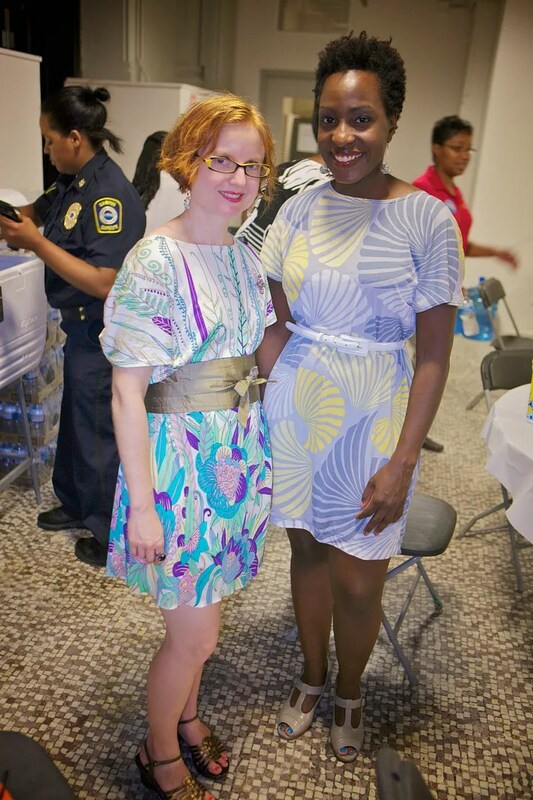 More importantly, Trena and I were both in the same Burda 06-2010 #123 dresses of our own making in totally differnt prints. 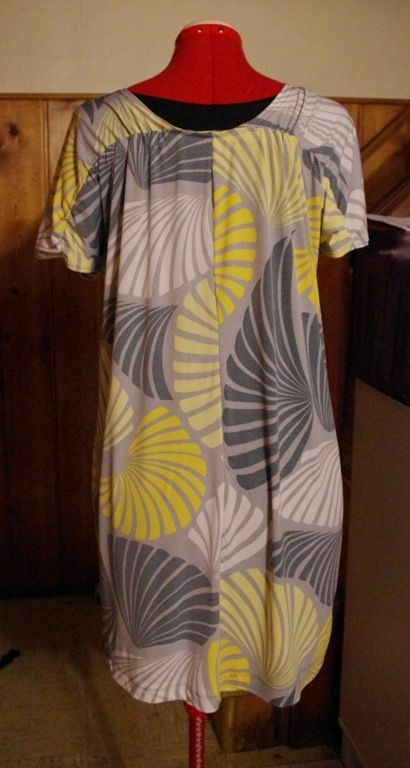 She went with an elegant silk jersey, and I made up this yellow and gray polyester from Philadelphia’s Jomar. According to her, the fan fabric is just $3 a yard. So, the dress was under $10 and I have a bunch leftover. As Trena mentions, the swayback in this is pretty significant. I took out two inches and could have taken out another 1.0 to 1.5. This was my test run of the plaid sack dress. This first version is two inches shorter. Which is fine just as long as I don’t try to blouson it like I did the silk version. I think this length is also a little ‘stumpier’ on me vs the plaid dress. But, the right length for a summer cocktail party with fancy people. Overall, it was a good night. I had fun with my bestie and got to show off my town. Wow! Looks like such a fantastic festival! Your dress is great and I love that you both went with the same pattern! Such a lovely group! What a cute dress! I love, love that print! I’m from Baltimore…I love your blog, not only do you sew, but you bring “home” to me! Next time I come home, we have to meet! Sounds like a fun time. These dresses are cute! I may have to make my own version. I love the soft colors in this print, but I envy you your shoes. They look both stylish and comfortable. Care to share where you got them? Inquiring minds want to know. I’m loving these simple dresses you’ve been running up. And those shoes are uber chic. Looks Great!!! The simple syle of the dress really showcases the print. 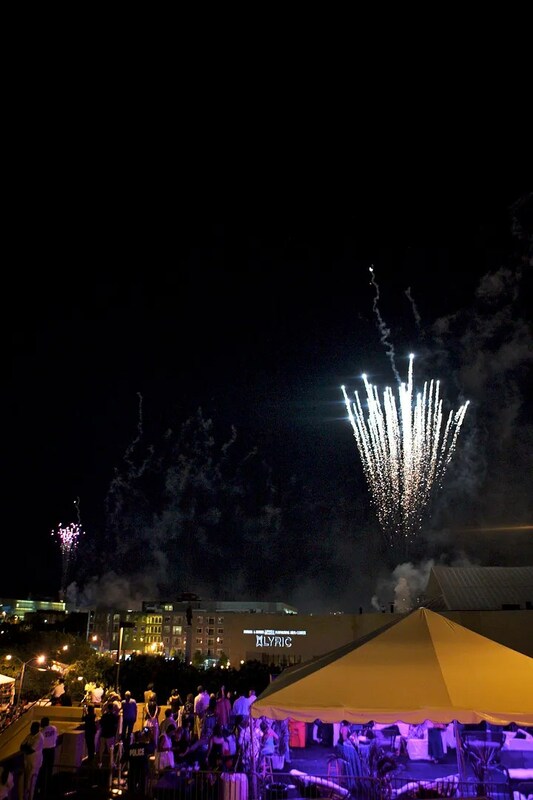 What a neat event to have happen right in your home town! You look great in your dress and you both looked perfectly outfitted for a fun night! Great dress! You and your friends look great! Looks like a great time was had by all!